Ok I played around and constructed a flash bounce very similar to yours as well and I would like to post my very unscientific and perhaps practical results in your thread. Maybe I should have chosen a subject that sits a little more motionless but at least you can judge the shadows of the chair and the light reflection on the wall. I am sure many of you have seen examples such as these before but I hope this helps someone. If the flash has a diffuser why would you point it straight at the subject? 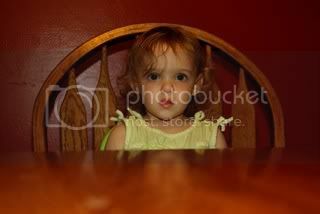 I thought the "rule" was to have the flash at a 45* angle when using a diffuser, stoffen type, which I guess ur using? I like these foam ideas, they'd probably hold up pretty nice compared to the cards I've always used. You will find the foam sheets in the craft section at Walmart for about 50 cents each. They also have stiff plastic mesh sheets for less than a dollar. Here are a couple of with and without photos to show how well it knocks down shadows. I have another idea on how to modify these flash bouncers and will provide details if it works. Anyone know why a hot glue gun wouldn't work, seems like it would speed things up. A great subject and the price is right. It is my experience that most glues used in hot glue guns will dry and become brittle and not flex. Although I did not try spreading it thinly to glue these materials for the diffuser. My experience with this construction of diffuser was that it did take several days drying for an all purpose glue such as Elmer's. Like a week. I set a few phone books to help smash the two materials together and let them set for many days. I did also end up hand stitching the outline and once up the middle to make sure the two pieces would stay together. One of my flashes is a 25 year old Vivitar 2800 similar to yours above but no swivel. So here's my StrobeScoop constructed from 5mm craft-foam and satin-sheen nylon. 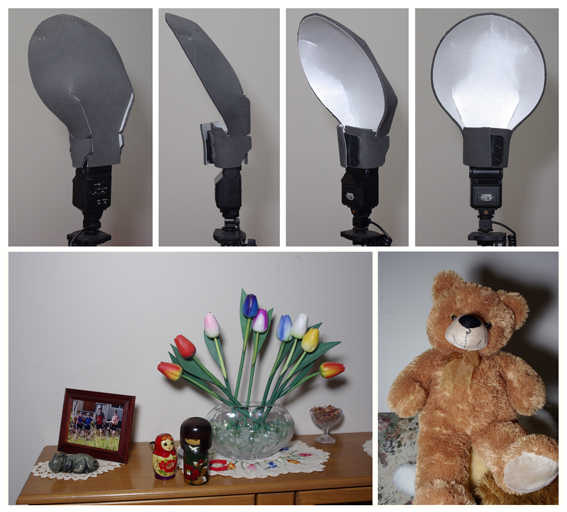 The aim was to get a broad diffusion from direct flash. I'm satisfied with the results, although as it's designed to scoop and push all light forward - (ie: no ceiling-bounce) - it needs to be used in conjunction with secondary light to lighten the shadows. The diffusion is very nice and gives a good sense of depth even when the subject is very close to the background surface. It's a handy addition to close-up/macro shots in the studio when diffused side-lighting is needed but there isn't enough room for reflector umbrellas. The whole thing is made from a single piece of foam. The forward-tilt is self-supporting and the whole unit is very sturdy. As usual, the unit fastens to the flashhead by velcro. This was the precursor to my CatchlightBounce (which, by the way, was used to take the profile shots of the StrobeScoop, seen here), and I was originally attempting to design something for on-location gigs but, as you can see, by the time I got to this prototype, it had evolved to a size that would be annoying and cumbersome in crowds and cramped spaces. Last edited by marcdsgn; 02-16-2009 at 05:31 PM.